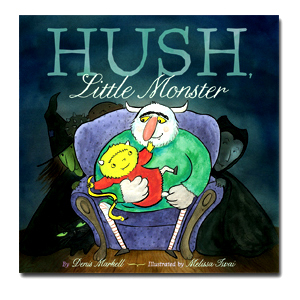 My most recently released book (August 2012) that I did with my husband, Denis Markell — he wrote it, I illustrated it — is Hush Little Monster. It is based on the song, Hush Little Baby, which we used to always sing to our little monster, Jamie. A monster father attempts to appease his cranky child in a clever riff on the “Hush, Little Baby” lullaby. “Hush, Little Monster, don’t you howl./ Daddy’s gonna give you a…/ screeching owl./ If that owl won’t say ‘whoo whoo’…/ Granny Ghost will bring you a big, bad boo!” Iwai’s monster father, with his red bean-shaped nose and Groucho Marx eyebrows, wouldn’t be out of place on Sesame Street. These husband-and-wife collaborators score some very funny moments while delivering a sweetly ghoulish story about a guardian’s love for a child (horns and all). Ages 4–6. Hush Little Monster can be purchased here. 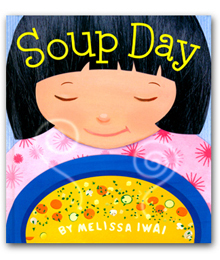 I both wrote and illustrated Soup Day, published by Henry Holt in 2010. It was my inspiration for starting this blog! I wanted to have a place where I could share healthy, kid friendly recipes, such as the soup that the daughter and mother lovingly make together in this book. I hope you enjoy it! Iwai’s writing debut beautifully depicts the loving relationship between a mother and daughter… Ordinariness made extraordinary. PreS-Gr 2–On a snow-speckled day, a mother and daughter approach the greenmarket as the child announces, “Today is soup day.” With economical text and vivid, multitextured collages whose upbeat charm belies their sophistication, the process of preparing the dish unfolds. In one spread, Iwai cleverly offers lessons about numbers, colors, sizes, textures, and what various vegetables look like. “This is what we put in our basket: One bunch of crispy green celery. Two shiny yellow onions….Six big white mushrooms. Ooops! We almost forgot the parsley.” Back at home, mother and daughter cut up and cook the vegetables, and, while the soup simmers, read together, build a city out of blocks, hide from a monster, and have a tea party. Then they add seasoning and the girl’s choice of pasta. While the alphabet noodles cook, it’s cleanup time. Daddy’s home, and the family eats soup together. The recipe is included. A perfect meal and a perfect book. Soup Day is available here. Oh yes! Just type in my name! Love your illustrations. I’ve always thought that would be such a fun thing to do! Maybe one day.